Mr. Poelman was born in Kalamazoo, Michigan, and lived there until he was 12. He then moved to the Chicago suburbs and lived near one of the runway flight paths for the O'Hare International Airport. Since then he loved airplanes, he was determined to fly and work on them later in life. After learning to fly in high school, he earned his private pilot license at age 17. He went to LeTourneau College in 1976 to learn to work on airplanes in preparation for joining a mission organization. Once he graduated, he volunteered at JAARS (Jungle Aviation & Radio Service) in Waxhaw, N.C., for a six month period after finishing at LeTourneau. While there, Mr. Poelman met his wife. They were married in 1980. They have three sons. A.D. Aviation Technology, LeTourneau University, 1978. FAA Airframe and Powerplant mechanic (A&P license), 1978 - no expiration. FAA Inspection Authorization (IA license), 1982 - remaining current through meeting annual requirements. FAA Private Pilot Certification, 1976. Completed a Graduate Research Project (Dec. 2007) as part of the degree requirements for the Masters degree from Embry-Riddle University. The project was titled "A Study of Maintenance Factors Affecting Aircraft Accidents and Incidents". While employed at Midwest Airlines in Milwaukee, Wis., he was an aircraft maintenance technician, supervisor, manager and project manager. He developed a curriculum and taught a three-day technical course for 100+ employees. He was a project manager representing maintenance and engineering during the acquisition of 25 Boeing 717 aircraft at Midwest Airlines. Mr. Poelman led five different "Kaizen" process improvement events while at Midwest Airlines. Attends the FAA Inspection Authorization Renewal Course annually. International Association of Missionary Aviation, 2004-2008. FAA meeting in Oklahoma City helping rewrite the testing standards for A&P Mechanics. Society of Automotive Engineers (SAE) Aero Design Competition, 2004-2008. Women in Aviation International Conference, 2002, 2005. Involved with New Covenant Church in Longview, Texas. Completed a three part (10 weeks each part) foundational training class for ministry. I consider it a distinct privilege to be an instructor at LeTourneau University. 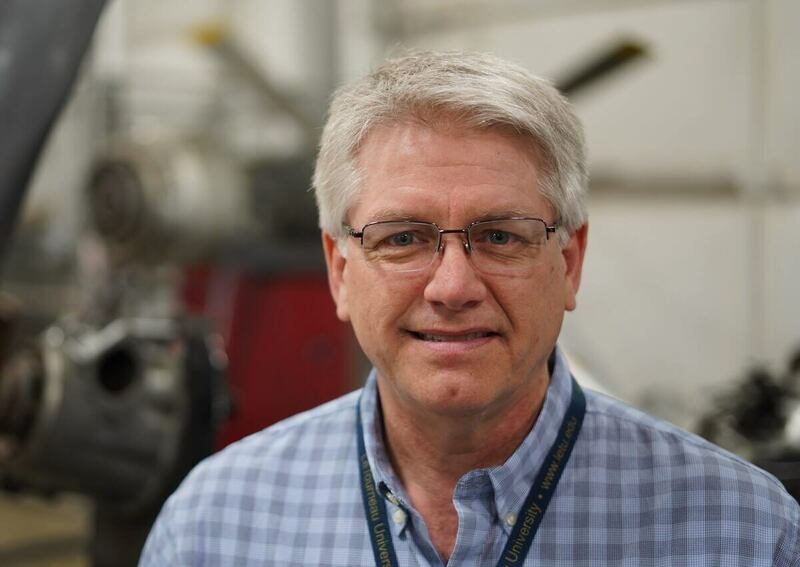 I had not fully considered teaching at my alma mater until I heard about the tragic death of Marty Donner, a former LeTourneau aviation professor who greatly influenced me as a student. I always remembered his family's hospitality to me during my years at LETU. I wanted to influence people the way he influenced me. When I heard of his death, I believe the Lord touched my spirit and prompted me to take action by putting my résumé together and sending it to LeTourneau. It was a step of faith by my wife and me. We knew I had great employment at an airline and that LeTourneau had no current openings for an aviation instructor. Well, 45 days later an opening came available, and two months later, I was hired. I know God has us here as a part of His providential plans. My wife, Sally, and I talk often about how blessed we are to be involved in an environment such as this. Sally is also employed on campus. Our goal is to be used by God. Among these young people, we encourage them to stay close to the Lord and testify about God's goodness and faithfulness.